On today's podcast, I move from the Little Mermaid themed area into the Beauty and the Beast area. I tell some stories, wander into Gaston's Tavern and hoist a Lefou's Brew, and eat lunch at Be Our Guest. And you get to come along and hear all about it! On today's podcast, I am at the Magic Kingdom, and I am exploring the new FantasyLand. Most things are open now, except for the Fairy Tale Hall (Princess meet-and-greet) and the Dwarves' Mine Train. So, join me as I make my way around the StoryBook Circus and into the Little Mermaid area. There are stories to tell, and you can journey with me Under the Sea with the Little Mermaid. I am an i-device developer, and created an iPhone and iPad app for seeing and sharing Hidden Mickeys. The great part is you can see them all, and add your own! Don't have an i-device? You can still take part. 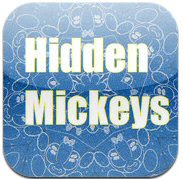 Just point your device to http://disneypodcast.net/hidden-mickey to view them online. Recently, I took a trip to Walt Disney World, and I got an RFID-enabled card. I talk about the card, the experience, and what I know about the technology and speculate on what they're doing with it....come along and listen in and please let me know if you have any additional thoughts on the matter. Is it reading your fingerprint, or isn't it? What does Disney do with this information anyway? What does the future hold? I certainly don't know, but I try and set a context for you.